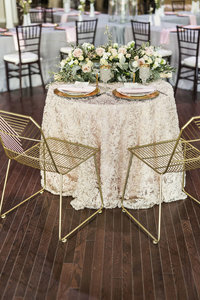 As we approach the summer months, there are 3 must haves at your garden wedding to ensure your guest remain comfortable. Fans. Fans don’t have to be drab or outdated! By enlisting a graphic designer, you can turn your simple fan into something fabulous that also doubles as your wedding program. By doing this you are saving money and ensuring your guest will hold on to this precious memento –definitely if your relatives are southerners, being from the south, I know Texas heat isn’t a joke and I can only imagine how hot some of the other states can get. So as you say I do at one of our lovely beaches in Virginia or at one of our beautiful garden venues, such as the Norfolk Botanical Gardens, don’t forget your fans. Refreshments. Hydration is key! There is nothing like sitting in the blazing sun without something to quench your thirst. Give your guest a little something to wet their whistle such as a lemonade station or an awesome water bottle station to visit as the take their seats and enjoy your special day. I scream. You scream. We all scream for ice cream! Crank up the wow factor during your cocktail hour by bringing in a boutique ice cream truck or ice cream bar. I personally love two of our local favorites, Confetti, which is a gelato boutique that specializes in creative flavors to entice your palette and Kona Ice, a snazzy shaved ice truck that leaves you feeling refreshed and ready to celebrate. I don’t know about you, but I absolutely love every bit of the hot summer months and I can’t wait for them to swoop in like a wrecking ball and warm our bodies, as I am over the winter chill of Virginia Beach. Need help designing your creative drink station or designing your fan programs, give us a call or contact us.